(The Metro) Game Plan: "Follow the 3 Muses" with the addition of "Pearls on a String." Three dancers lead the whole group through this dance. There is a Center-Muse spot marked in red on the center Triangle. All follow the center Muse "loosely," that means in their own way. A Muse will always only offer movement suggestions. Everyone is free to follow or do their own moves, or any mixture of the two. We are learning to move as a whole group as well as moving together in teams of 3 dancers. Navigating throughout the whole room is exciting and challenging. (Move around) In this MUVE dancing game teams of three student dancers negotiate using the space in between and around each other. Basic instruction: Move through the space created by your two fellow team members without touching each other. The students are learning to provide space for others as well as to claim space for themselves. When do I proceed? When do I claim the space. This community dancing game provides the opportunity to learn about teamwork and interaction. Because all three dancers move at the same time their physical agility is exercised. It's fast and it is fun. The more you practice the more fluent the team-movement becomes. (Mi Nina) In this game we are learning to work as a team and lead each other in spontaneous dance moves. The dancing starts on the Triangle Grid. Each Triangle has a specific corner marked with a red dot. This is the "Muse-Spot", whoever occupies it is the leader of their triangle-team. When the teacher/caller gives the command to "Break out," the students on the red spots now lead their teams in a snake dance all around the room. After a while, the teacher calls a "Mix-up" and everyone finds a new triangle with new team mates. We start all over again on the Triangles until the next "Break-out." (To Much Time) This MUVE Dancing Game is called the "Muse Circle." 7 kids are volunteering as lead dancers (Muses.) On the Caller's (game leader) signal. the Muses rotate clockwise into the next Triangle. With each rotation an new combination of dancers explore creative dance together. (Strut) This is an example of a Double Revolving Game, one of the MUVE Dancing Games from The MUVE Curriculum, a Comprehensive School Activity Program CSPAP. With each "Call" dancers on the MUSE-Circle move one position clockwise, while everybody else moves one position counter-clockwise. This results in new team combinations for each Call. (Moves like Jagger) In a MUVE Dancing Game players inspire each other with their improvised dance moves. Every move is community property - anyone is allowed to copy/follow any move. The dancing games you are watching here is called INDEPENDENT TRIANGLES. It is one of the first games that was developed and continues to be a favorite for all age groups from children to adults, seniors and the elderly. 3 or 4 dancers alternate leading their little team in the dance. (Another Night) These 4th Graders exercise at a MUVE dance after school program. MUVE school exercises are super easy to do with your students.For this spontaneous dancing game we taped MUVE "MOTIONS" Concept Cards to the floor. As the dancers enter the space they create movements inspired by the cards on the floor. At the same time we are also creating a group movement as we follow each other in a fast moving conga line. (Cut Me Loose) Get Your Party Moving! This MUVE Dancing Game is called The Partnering Game. People are randomly paired to create a spontaneous dance together. Every now and then the Caller calls for a "MIX." The pairs break up and everyone finds a new spot and a new partner. There are stickers at opposing outside edges. Each spot corresponds with one on the other side of the room. This is an easy to set up dance party workout that can bring much live to your party. Your guests can dance at their own level. They'll be giving their digestion a nice boost and will feel refreshed and invigorated after much dance excitement. Another great benefit is that everyone get to dance with everybody! (Riva) To date there are 18 MUVE Dancing Games explained and demonstrated at https://muve.org/muve-dancing-games/ . MUVE school dance exercises are so much fun to do, that the kids don't even realize that they are exercising. This MUVE Dancing Game is called the Cascading WAVE. Each dancer leads one movement into the center and back. This could also be played in a CIRCLE formation. (In the Bag) Learning to dance to the beat and move with the rhythm is easy to teach, using the MUVE’s Catch the Beat Lesson. Each song has an underlying pulse that marks time and common beat for all instruments. In this dance along video, students have the opportunity to experiment accentuating the common beat of the song, by slowing down and speeding up movements. In MUVE the beat is identified by acknowledging the most common 4 count. The Wave is a group mirroring game, where each side takes turns inspiring the other with new dance moves. The first group collectively chooses a dancing concept that they will dance to the center line. In response, the second group first watches movements, learn it and echo it back. In this version, the dancing concepts are given by a caller on each side. The Caller uses the beautifully designed MUVE Animation Cards to to give visual reference for dancers. (If I ever feel better) This MUVE Dancing Game is called the CIRCLE JUMP. There is one "Muse-Spot" (a sticker on the ground) in the center. When the game leader calls for a "Switch" the current lead dancer leaves the center and whoever gets to he center-spot fastest is the next Muse (dance leader). In this game the children are learning several things. One is to overcome their shyness and assert themselves by competing for the Muse-spot. Another is to mind others, not to bully and push but to be gentle in the process. It's important to discuss this at the start of the game. You can JUMP for a second time, but only if there is not another dancer who has not gone before. So we learn to look out for and encourage each other. Then when we get to the center we learn leadership by offering our movement ideas to the group as we practice our creativity by pulling fun dancing ideas out of thin air. (Thriller) Independent Triangles with Break-outs and Mix-ups. This is a great example of how you can "mix-up" your students to play with peers they might not otherwise seek out. This highlights the social aspect of the spontaneous MUVE dancing games. With MUVE, exercise in school takes the form of dance games for kids. It's easy and fun dance exercise your students will love! Students inspire each other with ideas for dance movements. Teams of three students dance on triangles marked on the ground. One position is specially marked as the "Muse-spot". Whoever lands on this marker is the lead dancer (teaches leadership skills) for the other two dancers in the team. When the Caller calls a "Break-out" all dancers freestyle around the room until the next call "Mix-up" lets everyone find a new spot in a new triangle with new partners. Watch these 3rd graders exercise in school, as students dance the Opposites and demonstrate MUVE's new Dancing Game- The Wave. In this MUVE Dance Lesson, Maggie shows children that dancing the opposites help dancers creatively explore the full range of their movements. The Wave quickly became one of MUVE's favorite exercise activities for kids because of how the whole group can collectively dance and share their dancing ideas altogether. The Wave is a group mirroring game, where each side takes turns inspiring the other with new dance moves. The first group collectively chooses a dancing concept that they will dance to the center line. In response, the second group first watches movements, learn it and echo it back. In this version, the dancing concepts are given by a caller on each side pensive. The Caller uses the beautifully designed MUVE Animation Cards to to give visual reference for dancers. (Sweet Dreams) In this game students create a dance together with a partner. In preparation of this game, markers are placed on the long side-lines of the room. Spaced in about 3 feet intervals, each spot has a corresponding mate on the opposing side. When the Caller calls "MIX-UP" the connection is broken and all players find a new spot on the side-lines and see who their next partner will be. NOTE: "MIX-UPS" take time, especially for large groups. Make sure players know to help each other find the empty spots fast, so the dance can continue without delay. Encourage players to dance freely around the entire room and not get stuck at the center-line. Check the Dancing Game Page at the muve.com website! And these games are just as much fun for grownups! This dance along video shows how you can perform a MUVE dance along for an audience or camera. Whoever dances in the center position is the lead dancer also called the Muse. In order to rotate all players through the Muse-Spot we are using the standard Triangle rotation and then switch the outside positions to move two new Muses into the center Triangle. Result is that all players get to be the lead dancer (Muse) and their position changes are nice and smooth with no-one disrupting the view of all dancers and especially the Muse. Dance Exercise Activities for Kids – Improv Dancing Game for Students. (Good work) This is an example of a TRAVELERS Game, one of the MUVE Dancing Games from The MUVE Curriculum, a Comprehensive School Physical Activity Program CSPAP. There are three different roles to play in a TRAVELERS Game. Each Triangle has a Muse-Spot (Red) a Home-Base (Green) and a TRAVELERS-Spot (Yellow). Upon the Call "Move" The Muses move clockwise on the Muse Circle into the next Triangle. The Travelers move counterclockwise to the Traveler-Spot (Yellow) in the next Triangle. The Home-Base player stays in place throughout the whole song and helps the other players find their spots. This game requires special attention, cooperation and sponsors creativity. It creates a new team of dancers every time a Move is called. (Strut) This is an example of a Double Revolving Game, one of the MUVE Dancing Games from The MUVE Curriculum, a Comprehensive School Activity Program CSPAP. With each "Call" dancers on the MUSE-Circle move one position clockwise, while everybody else moves one position counter-clockwise. This results in new team combinations for each Call. 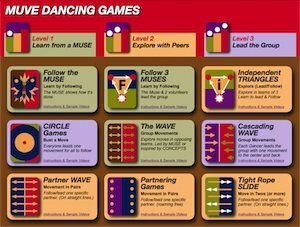 There is an entire School Dance Curriculum available for free at MUVE.com. Check out more free video workouts at the MUVE video blog. These low impact dance workouts help kids improve physical skills as well as offering opportunity for creative explorations in improvisational dance. MUVE Dancing Games also help children develop social skills, as they lead and follow each other and work on common tasks together in ever changing combinations of dancing teams. Three groups of 3 dancers demonstrate at the Senior Expo 2010, how a simple set-up with markers on the ground can animate any group of willing participants. NO practice or rehearsals are necessary because a MUVE dance is always spontaneously created. This is an easy way to get motivated to get in shape at home with your own family. Try it out with your kids. They can use the exercise as a break from their many hours of sedentary fun at computer games and television. And you can probably use some invigorating movements too. Chances are you don’t give yourself enough time to play. Dancing games relax your mind and invigorate your body – they are a healthy physical activity that doesn’t cost you a penny. As you can see 4 and 84 years olds can play this dancing game together. Play it with your guest at your next party! This MUVE Dance Exercise Game is super easy to initiate. Line up your dancers in a circle and mark one spot as the "Muse-Spot." Whoever dances there is the lead dancer, and supplies ideas to the rest of the group. The other dancers interpret the ideas to their own hearts content and make it their own style, size, shape, tempo or energy level. This dancing game can be played by pre-schoolers and seniors alike. And, they can do it together! When the game leader called "Huli Huli" (a Call of the MUVE Dancing Games) all dancers step one position clockwise and a new Muse takes over the lead. This MATRIX MUVE Dancing Game shows 5 dancers taking turns to lead. You can download the detailed instruction with the link below. In this set-up two triangles are created with the Muse-spot the middle. This is one of my favorite games because you never know when you'll be up next. It's always surprising how quickly a dancing game will get your energies flowing.